19° A shower or two. Rohan Bewick goal wrenches the momentum back from Blues. Blues InterchangeBrock McLean off due to an injury. Lions InterchangeMatthew Leuenberger off due to an injury. GOAL BLUESRobinson out flies Yeo in the air, marking 20m from goal directly in front. He makes no mistake to give the Blues a 16 point lead. BEHIND BLUESGarlett marks on the boundary, about 35m out. He comes in and his shot at goal is offline. BEHIND BLUESRobinson with a quick draw McGraw type of shot at goal and he hits the post. BEHIND BLUESWaite marks across half forward. He finds big Kreuzer inside 50. He takes his shot on goal and it drifts away to the right for a point. Walker attempts to take a screamer on the Brisbane behind post, but just can't hang onto it. Lucky for him Tuohy is there to back him up. Lions InterchangeDayne Zorko off due to an injury. The Blues are away from half back, but they look to have got themselves in a little bit of trouble. It has been a very quick start by both teams on a perfect night in Queensland. GOAL BLUESLucas comes out and takes the mark in the pocket about 40m from goal. He comes in and unloads a beautiful kick for goal, for his second of the night. BEHIND LIONSAdcock spots the lead of Brown and goes to him, taking the mark 40m from goal. He hooks it away to the left for a point. GOAL BLUESWonderful crumbing by Lucas, who runs into the pocket, slams it onto the right boot and slots through the goal. GOAL LIONSRockliff takes it out of the pack, kicks it around the body and it is through. The Lions are up and about here. BEHIND BLUESBell finds some space and takes the mark 35m from goal on a slight angle. He sprays the shot on goal. GOAL BLUESWaite with a leaping mark in the goal square. He kicks an easy goal to give the Blues back the lead. GOAL LIONSDocherty sees the break in play, he spots up Bewick on the lead, he goes to him and he kicks a great running goal. BEHIND BLUESWaite floats a shot on goal, but it flies away to the right for a point. The subs for tonight are Green for the Lions and Bootsma for the Blues. The ball is bounced in the middle and we are under way. Welcome to the GABBA for the match between Brisbane and Carlton. The Lions have one late change, with Docherty coming in to replace Golby. Blues are as selected. Welcome to Gabba for the Brisbane Lions v Carlton Round 9 clash. 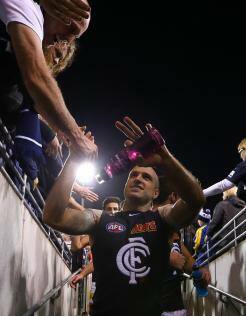 CARLTON has scraped home to defeat the Brisbane Lions by 13 points at the Gabba on Saturday night, moving into the top eight for the first time this season. Despite some terrible kicking at goal that left the door ajar for the Lions until the dying minutes, the Blues hung on to win 13.20 (98) to 12.13 (85). They now move to a 5-4 record and leapfrog Collingwood, Richmond and Port Adelaide on percentage to jump into the eight. Carlton host Greater Western Sydney at Etihad Stadium next Saturday. In a see-sawing contest played in in perfect conditions, the Blues led by 32 points during the second quarter only to lose the lead before half-time, then seemingly had control for most of the second half without burying their opponents. They kicked 5.13 after the main break and the Lions weren't much better, kicking 3.9. 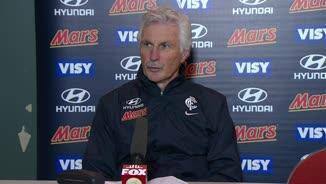 Carlton coach Mick Malthouse was pleased with the win, but said poor kicking could have easily cost his side. "It’ll bite us one day if we don’t do something about it," Malthouse said. 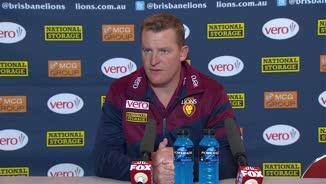 "We’ve missed too many in the last few weeks from positions where you should just kick goals. 6.4m (wide) - it’s not exactly tiny. "We seem to be making it narrower every time we have a shot for goal. "Is it technique, I don’t know? Is it mental? I think once you miss one you tend to tense up a bit." But the Blues thoroughly deserved their victory, hunting in midfield packs to win the disposal count (344-293) and inside 50s (58-43). Brock McLean was superb with 25 disposals, including eight clearances, before being taken off with a heavy head knock midway through the final term. Jarrad Waite continued to show just how valuable he is in the forward line, giving Joel Patfull headaches all night. 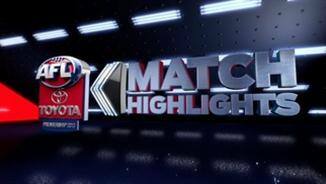 Waite grabbed 12 marks – seven of them contested – and despite having his usual troubles in front of goal (3.3), he was arguably the difference between the teams. He had plenty of mates missing gettable set shots though, with usually reliable Bryce Gibbs and Jeff Garlett among the culprits. It was a poor night for the Lions who not only lost the match, but suffered an injury to ruckman Matthew Leuenberger (dislocated thumb), who was rushed to hospital afterwards for scans. Co-captain Jonathan Brown could also face trouble with the match review panel. 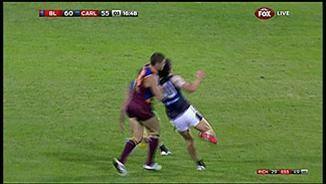 Just seven days after losing defenders Daniel Merrett and Justin Clarke to suspension, Brown was involved in a third-quarter incident with Blues defender Michael Jamison. Brown appeared to collect Jamison with a left forearm to the head with enough force to have the Blue holding his head for the next three minutes. Lions coach Michael Voss said he did not see the incident. He said the Lions played only one good quarter of football and were lucky to be in the game as long as they were. "I think Carlton deserved their victory. It would have been the one we stole I think," Voss said. "Carlton probably could have put us away several times but didn't and we got a couple of looks and we weren't good enough to finish it. In the end that was pretty much the game." Carlton led by more than five goals at the 13-minute mark of the second term before an extraordinary burst by the Lions changed the game. In the space of 13 minutes, the hosts slammed on six goals to take an unlikely half-time lead. Brent Moloney was the catalyst with 10 disposals, three clearances and two goals as the Lions' pressure went from non-existent to rabid in the space of a few minutes. But they couldn't maintain the rage after half-time and Carlton ran over the top.